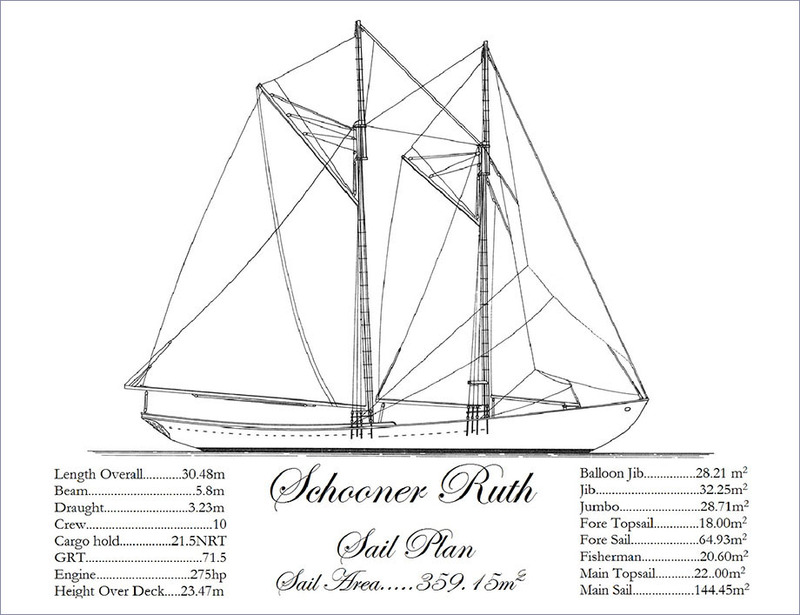 Schooner Ruth was designed by naval architect Thomas E. Colvin, with her lines & rigging based off of the knockabout fishing schooners of the Canadian Maritimes and New England such as the famous grand Banks fishing schooner Bluenose of 1921. She is a cargo schooner who has the ability to deliver a wide range of cargoes around the world. Indeed, her steel hull was created with ice-bound voyages in mind. Nearly all of the rig hardware & fittings, such as the Ships Helm & bronze deck pumps, come from traditional schooner patents which have been around for over a century. Her full complement of sails and all of her wooden blocks have been specially hand crafted by generations-old Canadian companies from Nova Scotia, just as they would have been in the early 1900’s. The smell of New England Pine Tar on every served stay & pure Barbados beeswax on every hatch convinces all who has stepped onboard of the authenticity and detail surrounding them. It is intended that this quick schooner will make way primarily by sail power, having an auxiliary engine to fulfil international standards and for extreme situations. With hope of being able to push upwards of 12kts under sail, there should be little reason to regularly require the engine! 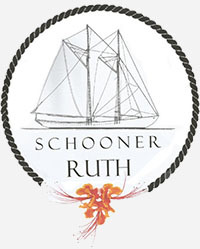 Schooner Ruth will provide seamanship and traditional sail training to educate the young adults ( 18-25) of Barbados , OECS, Canada and elsewhere about historic trade connections between their countries. Though seamanship and sail training, movement of local manufactured goods and fresh produce , Schooner Ruth intends to strengthen bonds between Barbados & the Windward Islands. Schooner Ruth intends to promote Barbadian and Canadian goodwill on behalf of the past, present & future with all she visits.